Suite rooms at the Verda Saffron extends the pleasant and comfortable stay to our guest. Well furnished and elegantly decorated, suite rooms at The Verda Saffron extends a pleasant and comfortable stay to our guest. Featuring a total area of 550 sqft. each room has an open window which offers a picturesque view. The suite rooms are filled with all the modern amenities including hairdryer, bedside lamp, flat screen television, room service, telephone, rollaway bed, tea/coffee maker, temperature controller, free wifi, bathtub, etc. 1.) Check in / Check out policy is 12 noon. (2) One child under 6 years stay free using existing bed. 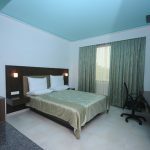 Charges for extra bed/mattress additional Rs.1000/-. (3) Primary guest must be 18 years of age to check in. (4) As per Government regulations, It is mandatory for all guests to carry a valid photo identity address id proof at the time of check-in. In case, check-in is denied by the hotel(s) due to lack of required documents. (5) Local ID proof & Pan card will not be acceptable as ID proof. Cancelllations can be done 24 hours prior to arrival else 01 night retention will be charged. Stay of 1 child up to 6 yrs of age is complementary without mattress. 06 years and above breakfast is chargeable also if required Extra bed will cost Rs.1000/- additional.